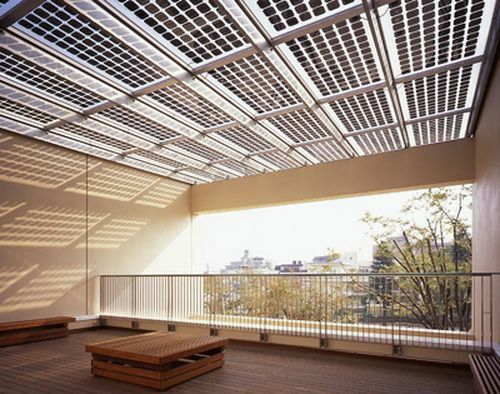 We know solar panels as big flat frames with glass in front and an aluminium rim, plastic at the back. They are quite heavy, for instance the 320 Wp LG Neon Black panel we recently used in a 10 panel installation weighs 18 Kilogram. Strangely there is no real need for both the aluminium and the glass in these panels, but they have been required by law for panels imported in the EU. Solar panels have been put under severe scrutiny from the beginning (apart from Shell basically killing the industry for 20 years) simply because they compete with the then very rich and ruling energy cartels. You can find many examples of how the fossil energy interests have stifled development or market entry of renewable energy sources, this is just another one of them. For ‘bespoke’ panels or ones made in Europe rules must be different. 10 years ago already we say simply laminated plastic panels measuring 3 by 4 meters about, at the Saint Gobain factory when we visited to test some glass laminated panels. Once you have a big machine that can melt the EVA you can make panels using UV resistant plastic that last a long time. Those panels with big cells (20 cm x 20 cm) where not for sale as far as we know. Now there are new types of glass. Thin films of glass can be laminated together to build bridges and car roofs (like in the Tesla Model 3, X and S). Glass when thin is more elastic and the lamination distributes forces to make it even more resilient to cracks and impact. This seems to create a loophole in the “a solar panel needs a glass front” rule. The above panels look like the 12 volt laminated ones for caravans and boats, but apparently they are 210 Wp roof PV panels. Frameless yet with glass fronts. We think this is an important product to come on the market, because it is greener to produce, it is as effective but less of a hassle to install. The cost advantage is not only in less stuff but also in the panel itself and in the hassle of its logistics. The glass/aluminium framed panels are heavy and fragile, they are 4 cm high typically so you need space and power to move them. They require a serious logistics chain to produce, from bauxite mines to desert glass melting plants (in Mauritania for instance). All in all we think this type of panel, along with the Tesla Solar Tiles will quickly start to dominate the market. We are at least happy a product like this is available to speed up introduction of solar to its maximim, because that is what is needed. They are not for “Low load bearing roofs” but for breaking through the idiocy of heavy glass/aluminum panels!